Following up on yesterday’s post about bird irruptions, I wanted to talk a bit about attracting birds to your own yard. One of the great things about living in the country is that you can put up a birdfeeder. Well, true, you can put up a birdfeeder just about anywhere, but you’re not going to attract much to the birdfeeder at your 10th-floor condo balcony, and even in the suburbs in town you’re primarily going to have the resident House Sparrows coming to call, though you may be fortunate enough to have some other variety as well depending on your location within the city and relative to good habitat patches. In the country, though, because that’s where most of the birds hang out, that’s also where you’ll get the most bang for your buck in putting out a feeder. You’ll also have good success if you live near a ravine or naturalized park, or in a mature area of town with lots of big trees and shrubby backyards. Basically, anywhere where you’re close to natural habitats. Feeders are great tools for both enjoying and learning about nature from the comfort of your own home. They allow you to bring a little of the wildlife up close to the house so you can peer out the windows without having to get bundled up into your woolen toque and mitts, down jacket and longjohns, to hike out into the sub-freezing temperatures. Even nature-lovers need a break now and then, and there’s nothing like sitting by the fire, sipping a hot chocolate, while the animals come to you. 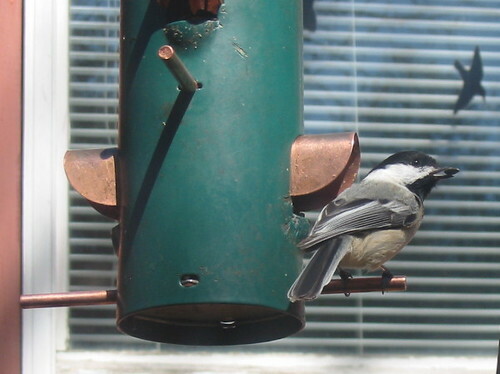 If you’ve never hung a feeder before and are looking for some tips, I would suggest starting with two types: a feeder with black-oil sunflower seed, and mixed seed scattered on the ground (or a platform feeder, if you felt like building or buying one). The particular feeder style you use to put out your sunflower seed isn’t especially important, although more birds can be accommodated by a house- or gazebo-style feeder than can be by a tube-style feeder, which is only really used by the smaller birds that can fit on the perches. Throwing the mixed seed on the ground, or on a platform feeder, attracts sparrows, doves, blackbirds and other ground-feeders that don’t usually come to hanging feeders. Black-oil sunflower seed is the variety of seed that probably attracts the greatest range of birds (perhaps slightly counter-intuitively, since you would think that would be the purpose of mixed seed, wouldn’t you?). Just about everything likes sunflower seed, because it’s so high in fat, and therefore energy. Striped sunflower seed is also good, but it’s a slightly larger seed, and so often can’t be eaten by smaller birds whose beaks aren’t designed to handle large seeds. Mixed seed usually contains one or both of these varieties, but in small quantities relative to the other types. 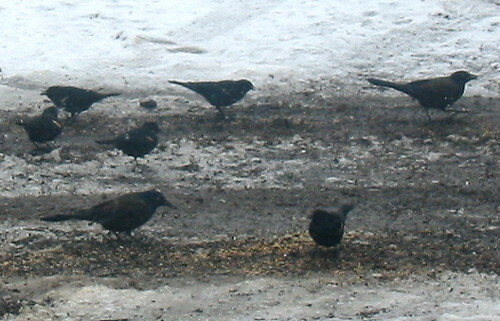 Cracked corn, which appeals to doves, various varieties of millet, often safflower seeds, and a few other types, make up the bulk of the mixed seed mix. If you have the room and inclination, and want to branch out into additional feeders, the third feeder I would suggest putting up is a suet feeder. Suet is usually some sort of fat, generally animal fat (such as what’s left in the pan after you make yourself bacon for breakfast), often, though not always, mixed with millet or mixed seed. It’s a very high energy source, and is a good replacement for insects. The birds who tend to visit suet the most are also the ones you’ll find foraging for bugs and larvae under tree bark or debris. 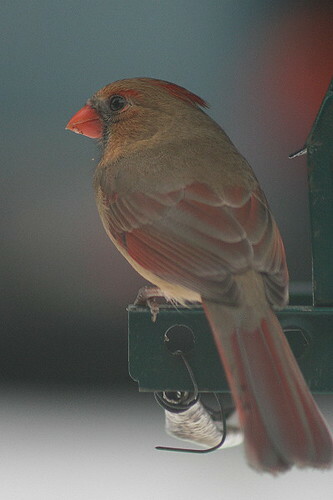 Often these birds will also come to your seed feeders, but you’ll see more of them at the suet. You can buy commercially prepared suet, or make your own. 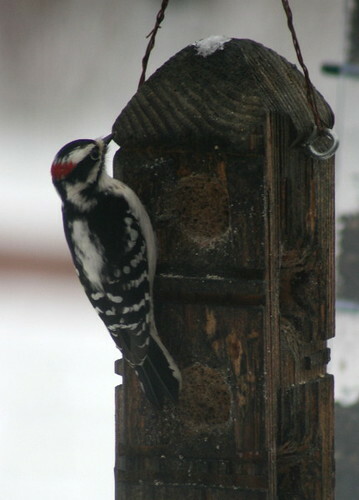 Julie Zickefoose has posted a great recipe for home-made suet (it comes highly recommended by her backyard birds!). If this birdfeeding bug has really bitten you, add a nyger feeder to your collection. Nyger is thistle seed, and is more expensive and attracts a more specialized crowd of birds, but the crowds it attracts! 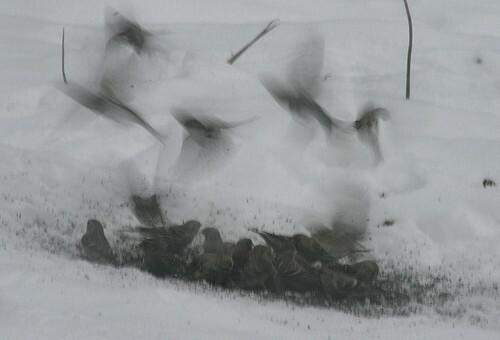 You’ll never see a feeding frenzy like those that come to your nyger feeders. Nyger is a favourite among the many species of finch: redpolls and siskins (which I talked about in my previous post), goldfinches, and Purple and House Finches. In the warmer months, from May through about September (and maybe a month or so on either side, depending on where you live), you can also set out food for some of the migrant and summer birds. An easy dish to set out is fruit, such as orange halves or peeled bananas. Fruit eaters such as tanagers and orioles will come to these fruit dishes, and provide a delightful splash of brilliance to your yard. 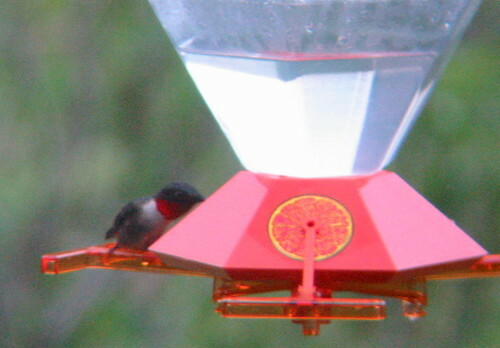 You can attract hummingbirds by putting out a special feeder (available in any feeder store) filled with a sugar-water mix (boil water and add sugar in a 1:4 sugar:water ratio). This mixture mimics the nectar these delightful little birds usually feed on. It’s important to remember to clean out these feeders regularly, as the sugar-water solution can get dirty, so they can be a bit more work than simply putting out seed, but are definitely worth it for the visitors you get. 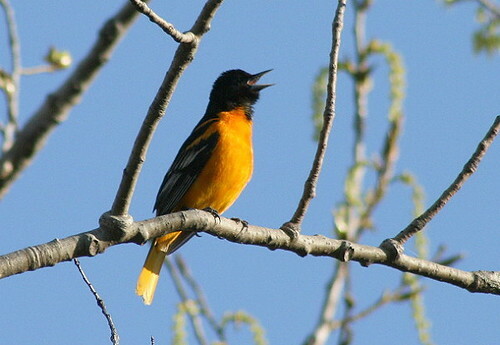 Orioles will occasionally come to visit hummingbird feeders as well, or you can purchase a specifically designed oriole feeder that you would fill with the same mixture. One last way to attract birds to your yard is to add features that will support them in some way. Berry bushes, seed-producing grasses and nectar-producing flowers are all great ways to provide food for birds. Shrubs and trees will provide cover from predators, as well as nesting spots. Putting out a birdbath will provide water and a place for birds to bathe (which in itself is a lot of fun to observe). 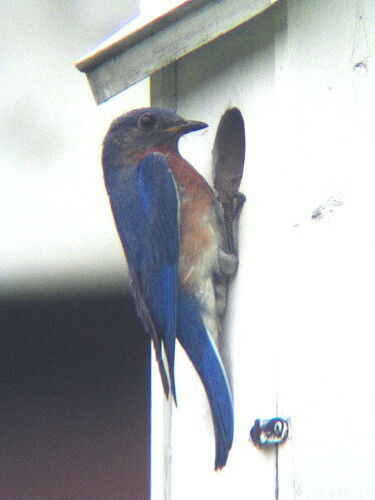 Adding nestboxes provides nesting spots for birds that usually nest in trees or other cavities. 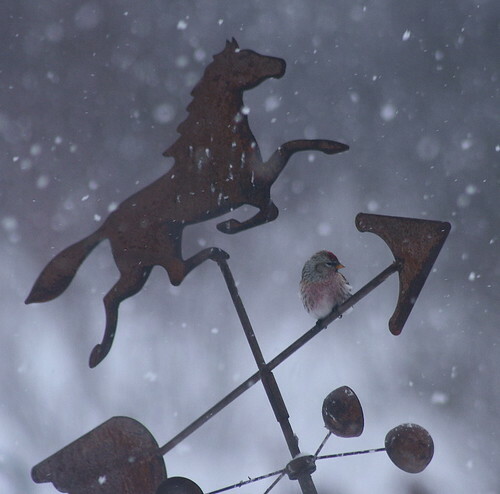 For seed preferences, check out the Cornell Lab of Ornithology’s birdseed preferences chart. According to a recent blog post by Brown, “Drivers, both professional and amateur, who have driven this awesome CSR-69 concept car, agree it is arguably the best handling Mustang they have ever driven. 9 magnitude earthquake has hit the northeastern coast of Japan, quickly followed by a 13-foot tsunami that has devastated the Miyagi shoreline. A totally free hack program, this hack tool is able to generate any amounts of Gold and Money for your account.